Alice and Oliver have a lot going for them. They are happy together, they love their jobs, and they have just had a baby girl. But Alice doesn't feel well as they head out of town for Thanksgiving, and she is soon diagnosed with leukemia. This may be a novel, but it is one of the most in-depth looks into the effects of cancer on the patient and her family. This is likely because Bock lost his wife to cancer in 2011. We see Oliver battle with the insurance company and try to find care for their daughter after the first deluge of help has subsided. The couple is initially thankful for help from friends and family, but the the offers soon become rare or just plain unhelpful. Alice and Oliver is difficult to read. In a story like this, we want everyone to be selfless: the patient should be grateful for the help of the medical team and family and never lose hope or be angry and the family should work endlessly to get payments in, schedule appointments, and be moral support without neglecting their own lives. But that's not how things work, either in this novel or in real life. 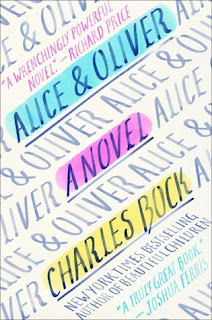 Both Alice and Oliver oscillate between being thankful for their good fortune in each small triumph and making increasingly dangerous decisions, especially when it comes to their marriage. We watch as they reach for each other in their darkest moments and then push each other away. One of my favorite aspects was the way other patients are woven throughout the story. Bock gives us a few pages of insight into their situations, before Alice bumps into them in the hallway or Oliver rides with them on an elevator. It reminds the reader that this is the story of one woman specifically, but thousands of people are waging a battle against cancer each and every day. I can understand that! I try to temper reads I think will be tough with some books that will make me laugh. Did you enjoy this despite it being a difficult read? I feel as though it could easily a book with characters who frustrated me too much for me too enjoy it!